Coinbase, the global cryptocurrency market’s largest brokerage and Bitcoin wallet platform with more than 10 mln users, has revealed its plans to integrate Segregated Witness (SegWit) in the short-term. On social media, the Coinbase team wrote “We’re working on SegWit support and will have a public update soon,” adding that the company is hiring more Bitcoin developers to develop the Bitcoin infrastructure of Coinbase. SegWit is a transaction malleability fix and scaling solution introduced by the Bitcoin Core development team which optimizes the Bitcoin Blockchain by reducing the size of transactions. Its malleability fix also provides a better platform for second-layer solutions like Lightning that are capable of processing micropayments or transactions with substantially lower fees on the Bitcoin Blockchain network. As with any other solution introduced on the Bitcoin network, businesses and infrastructures are not automatically equipped with SegWit. Rather, businesses, wallets and exchanges like Coinbase need to allocate their developer resources to adopt and integrate the solution. Many leading wallet platforms have already integrated SegWit. Namely, major Bitcoin hardware wallets Trezor and Ledger adopted SegWit during the first few weeks since its launch, given that SegWit’s transaction malleability fix provides an important security improvement for hardware wallets by reducing the transaction verification time and process. According to the Ledger team, SegWit further decreases the transaction fee of Bitcoin by approximately 35 percent. With such reduction in fees, users can easily send Bitcoin transactions with fees below $1. 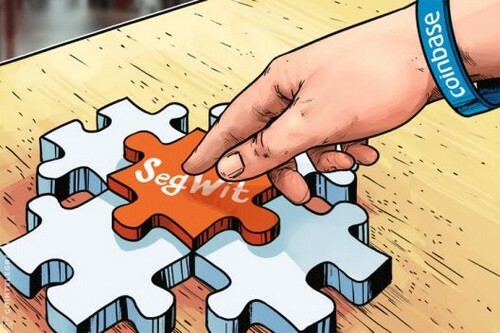 “SegWit introduces the concept of block weight which changes the way the transaction size is computed by splitting the signatures in a different area — you can typically save 35 percent of the fee paid when sending a transaction immediately,” the Ledger development team added. Bitcoin users can experience a reduction on Bitcoin fees through SegWit by either using SegWit-enabled wallet platforms or by receiving SegWit-enabled transactions. If a Bitcoin user receives a SegWit transaction, the user will be able to send SegWit transactions. Popular platforms like Coinbase, Blockchain, and ShapeShift account for large portions of the daily transaction volume of the Bitcoin network. Hence, as more platforms adopt SegWit, the adoption rate or SegWit transaction rate will increase rapidly. Currently, the transaction percentage of SegWit remains just below 14 percent, which can be significantly higher with the implementation of leading Bitcoin platforms and applications. In mid-November, Blockchain, the world’ second largest Bitcoin wallet platform behind Coinbase, also announced that SegWit will be integrated by Q1 of 2018. “This will be a major and complex update to some of the most sensitive parts of our codebase, across a wide variety of platforms and devices, affecting billions in user transactions with potentially significant privacy implications,” said the Blockchain team. Secret symbol № 22: 9 What is this?